The sunlight is dappled, the setting serene, and one's perspective is expanded when riding among the green giants of the Pacific Northwest. If you ever need to put things into perspective, take a ride amid California’s iconic Redwoods. These huge trees, some of which rise up 250 feet, are the tallest living things on our planet and trekking among them, you may yourself feel small. I can only imagine what the original settlers of California’s Russian River must have thought as they stared up at the towering redwood trees. I know I was amazed as I rode in Armstrong Redwoods State Reserve beneath redwoods that rose up to the sky the length of a football field, with trunks the width of a truck. If it hadn’t been for Colonel James Armstrong, who purchased and protected the area that is Armstrong Redwoods today, I probably wouldn’t be able to enjoy this 805 acre forest, where some trees are over 1000 years old. Colonel Armstrong, believe it or not, was in the lumber business. In the 1870s, his sawmill was producing millions of board feet of lumber per year. One might wonder why he chose to preserve the 440 acres that are part of Armstrong Redwoods State Natural Reserve today. He saw something special in that grove. Riding among the redwoods with a naturalist named Laura Ayers, I was beginning to understand what he saw. Laura’s love of horses and nature fuels her lifestyle, the mark of a modern cowgirl. I call it a lifestyle, because anyone who has horses knows that it’s a full time existence. Horses envelope you, showing you more of yourself and more of the world, making them an apt vehicle to explore a place like Armstrong. As I rode along on a patient chestnut horse named Linton, I was shown the world of the redwoods, whose mere calm presence tells stories of the unique history of the area. We passed by an old hollowed out trunk, leftover from a past fire. The thick bark of the redwood is amazingly resilient with high levels of tannins, which helps make them more resistant to insects and fire. More of the core of this tree had burned than the outside, leaving a hollowed out area. Laura told me the original settlers ran a fence around trunks like this, so they could use them as goose pens to keep their chickens and geese. Linton and I passed under a fallen tree, standing diagonal to the ground. If you’ve ever thought about the philosophical query “If a tree falls in a forest and no one is around to hear it, does it make a sound?” Laura will tell you that it does. It really does! She’s spent more time in the forest than anyone else I know, most of her life—long enough time to hear a redwood fall. Laura said that it was like a giant boom, so loud that she didn’t know what it was at first. The ground shook, and with the tree feel 1000 years of history. Darley Newman is the five time Emmy Award nominated host, writer and producer of the PBS series Equitrekking and Travels with Darley, also seen on AOL, MSN, and Huffington Post. She travels the world with locals, horseback riding in exotic locales to find the best places to travel and ride. On my trek with Linton, I rode him with a simple bitless bridle and he responded with even the slightest of cues, allowing me to look up to examine the knobby burls on one tree and rays of light streaming through the branches high above. It’s cool and quiet riding among the redwoods. Because of the deep shade, not as many plants blanket the ground and thus not as many critters choose to stay here. I listen, but don’t even hear any birds. As we ride by a tree that has fallen across the trail having been cut to reveal its diameter and clear the way, I realize that it would take a long time to count the tree’s rings to reveal its age. Even though Laura has ridden in Armstrong Redwoods State Reserve countless times, she relayed to me that one of the best parts about the Reserve is that she always sees different things. The forest to her is special, just as it was to Colonel Armstrong. 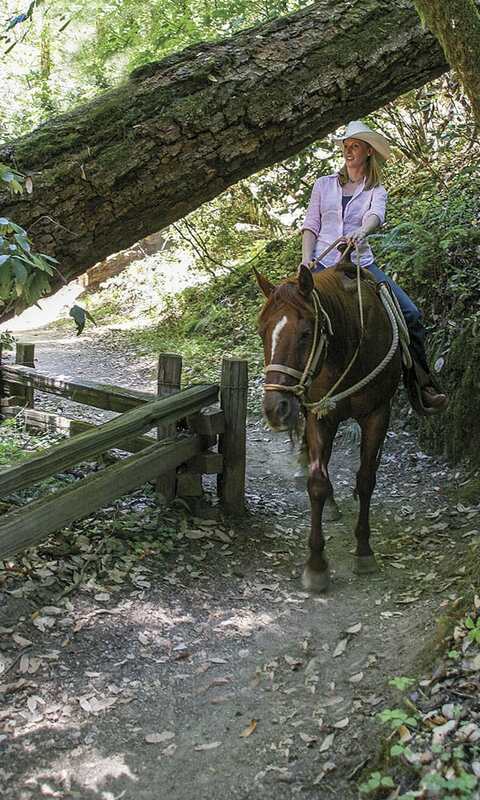 Armstrong Redwoods is open to horses during peak season in summer and closed in the winter season. You’ll want to bring your own horse or perhaps hook up with a local rider who may let you join them in this special place. Trailers can be parked in the Reserve’s front or east parking lots. 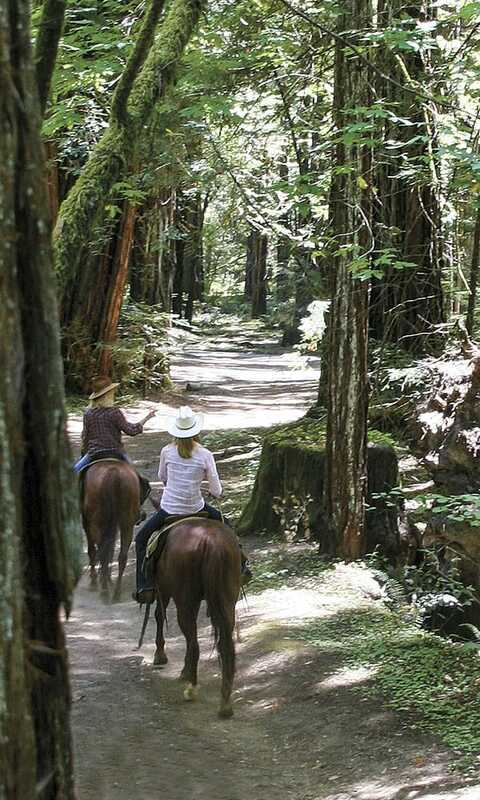 For those who don’t want to bring their own horse to Armstrong, another California spot to ride among redwoods is in the Redwood National Park, where the Redwood Creek Buckarettes give horseback tours.